I really like to cook. It’s the cheapest kind of therapy there is. Trouble is…it’s the most fattening kind, too! From time to time I’ll drop in a favorite recipe for you to try. Not all are completely “from scratch”, but they are all really tasty, don’t require a degree in rocket science to make, and tend to get rave reviews. If you’ve never tried the dipping oil at Zio’s you’ve been missing out on a real treat. It truly is one of the best I’ve ever had with just a teensy little kick to it. Crushed red pepper flakes, 1 T.
Ground black pepper, 1 T.
Dried minced garlic, 1 T.
If, like me, you enjoy a big, juicy steak with a slab of blue cheese on top but have been told your cholesterol level can’t take it anymore, here’s an alternative that cuts the red meat out of the equation without cutting the flavor! Honestly…I do not miss the steak! Rinse and pat dry chicken breast. Place between 2 sheets of wax paper and pound your frustrations out on it until it really thin, then sprinkle both sides with the McCormick’s Seasoning, garlic powder, and black pepper to taste. Cut in half to create 2 servings. Heat a cast iron skillet on low heat until searing hot. Place butter in skillet to melt. Carefully place chicken breast into skillet and cook for approximately 4 minutes on one side. Turn chicken and add mushrooms to butter. Allow to cook for about 3 minutes. Be careful…the mushrooms will pop like the 4th of July! You might want to use a mesh cover to protect yourself and your kitchen! Using a hot pad to protect your hand, place skillet in an oven set to 400 degrees. Cook for 6 minutes or until the blue cheese is melted. Using the hot pad, carefully remove skillet from the oven. Voila! I like mine with a huge, healthy side of sautéed spinach and an icy cold martini! Sift flour & salt into a bowl. Cut in shortening thoroughly until mixture resembles coarse cornmeal. Sprinkle in water and stir with a fork until dough almost cleans side of bowl . Gather dough into a ball and knead slightly. Roll out on a lightly floured surface. 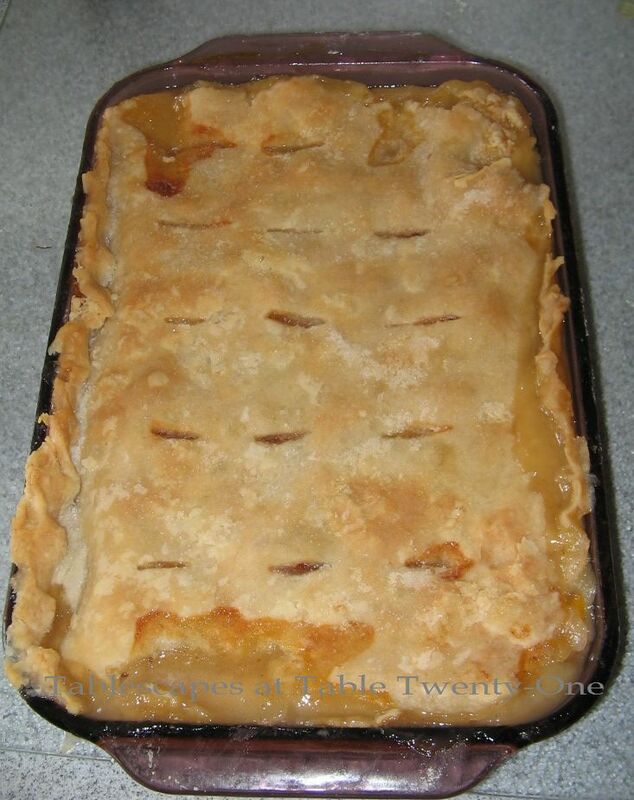 Fold in half and place in a lightly greased 9″ pie pan. Line pan, allowing crust to slightly overlap sides. Pinch around rim and trim. Brush rim with cooled melted butter. Place in refrigerator while you prepare filling. Note: I never really measure when preparing the filling. You can use a little more or less of the sugar and butter in the filling, depending on your individual taste. Sift flour & salt into a bowl. Cut in shortening thoroughly until mixture resembles coarse cornmeal. Sprinkle in water and stir with a fork until dough almost cleans side of bowl . Gather dough into a ball and divide into 2. Roll out on a lightly floured surface. Fold in half and place in a lightly greased 13 x 9″ pan. Line pan, allowing crust to slightly overlap sides. Mix together in a large bowl the peaches, sugar, butter, rum, peach liquid, cinnamon & nutmeg. Set aside. (NOTE: If you REALLY want that rum to REALLY get down in there and bring out the taste in your peaches, soak the peaches in the rum overnight! Don’t worry…the alcohol burns off while cooking.) In a small bowl whisk together flour & water to form a runny paste. Stir into peach mixture. Top with 2nd crust and trim sides. Make several small vent slits on top crust. Bake at 350° for 45 minutes. Remove from oven and brush with 2 T. cooled melted butter. Bake another 15 minutes or until crust is golden brown. Allow to cool slightly before serving. NOTE: I often substitute a can of RoTel for the green chilies. Preheat oven to 450 degrees. Lightly butter a baking sheet and set aside. 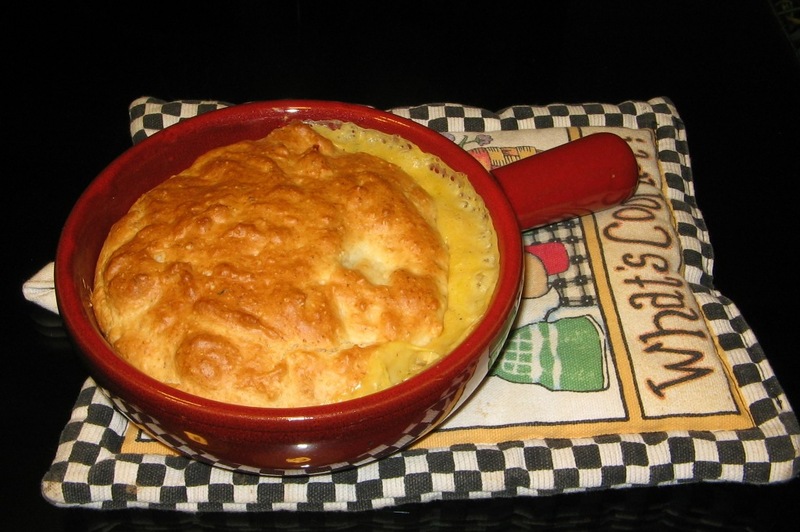 In a medium mixing bowl, mix Bisquick, water and cheese with a fork just until dry mix is moistened. Drop by large spoon onto the prepared baking sheet. Bake for 8-10 minutes at 450 degrees. Remove from the oven and brush on butter mixture. Best taste and texture if served right away. * For those watching fat and cholesterol, I Can’t Believe It’s Not Butter is a wonderful substitute! ** For those who prefer a more subtle garlic flavor, lightly saute the garlic in the butter, then mix in remaining seasonings and set aside. *** I have tested these using McCormick’s Garlic and Herb bottled seasoning with exceptional results! 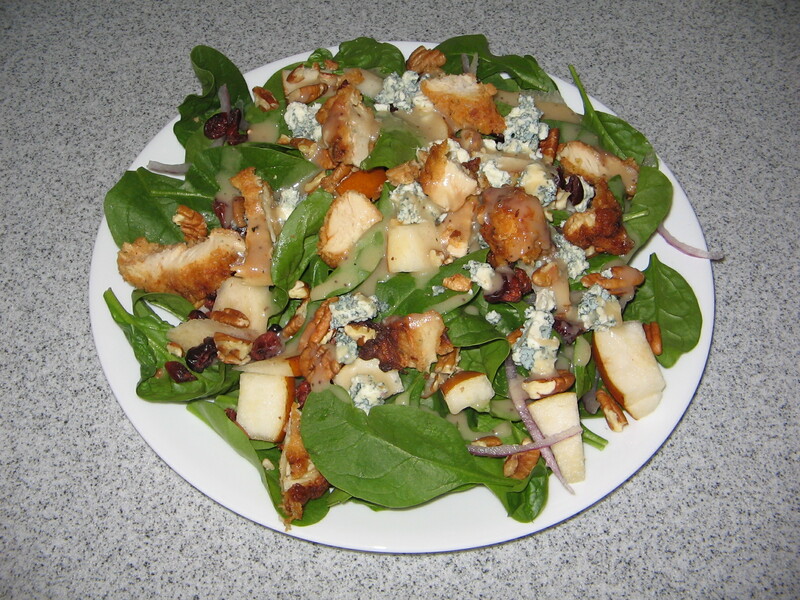 Place baby spinach on salad plate and top with remaining ingredients, ending with pear vinaigrette. 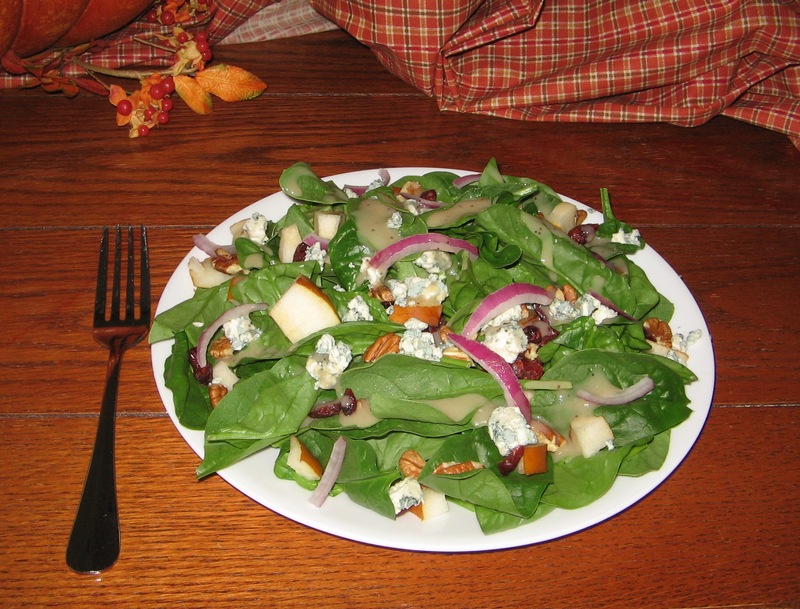 This makes a great luncheon or dinner salad. It’s my husband’s absolute hands down favorite! Whip cream cheese until smooth and spreadable. Stir in carrots, green onion, parsley and garlic powder. 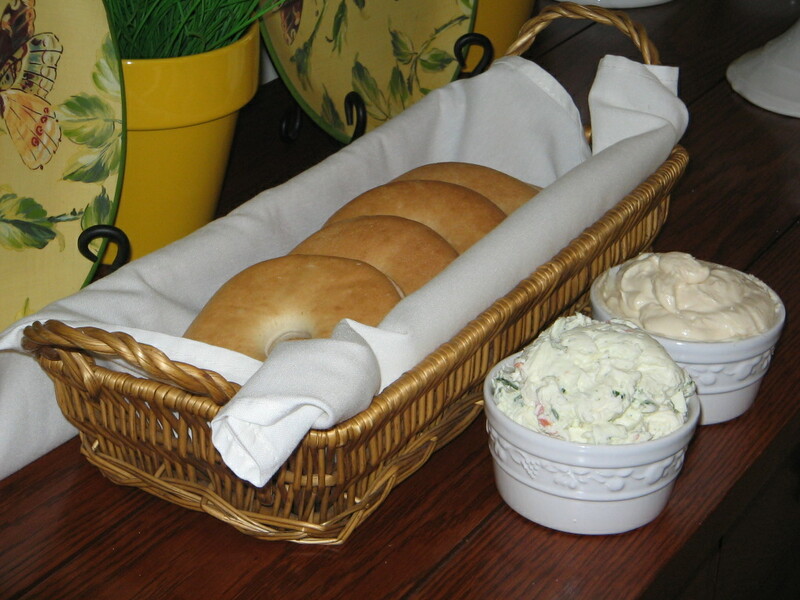 Serve with bagels or use as a tasty sandwich spread. For a sweet cream cheese spread, omit vegetables and spices. Whip cream cheese and gradually add about 1/4 c. honey (or to taste) and 1/8 t. cinnamon. Grease (regular or butter flavored PAM is great for this) an 8″ x 8″ cake pan. Set aside. Mix apples and sugar together in a bowl and set aside. Beat eggs slightly, then beat in oil and vanilla. Sift together flour, salt, baking soda, ginger & cinnamon; whisk alternately with apple mixture into egg mixture. Stir in walnuts. Bake at 350 degrees for 40 minutes or until cake tests done with a toothpick. The wonderful thing about this deliciously moist cake is that it tastes fabulous without icing! Should you prefer icing, however, a cream cheese-based one is great. Otherwise serve plain, dusted with sifted confectioners sugar, or topped with a dollop of ice cream or fresh whipped cream finished with a whiff of ground cinnamon. For the holidays, try it topped with a spoonful of caramel sauce or rum sauce! This cake can also be baked in tiny casserole dishes for individual servings. For a larger cake, double the recipe and bake in a 9″ x 13″ cake pan. 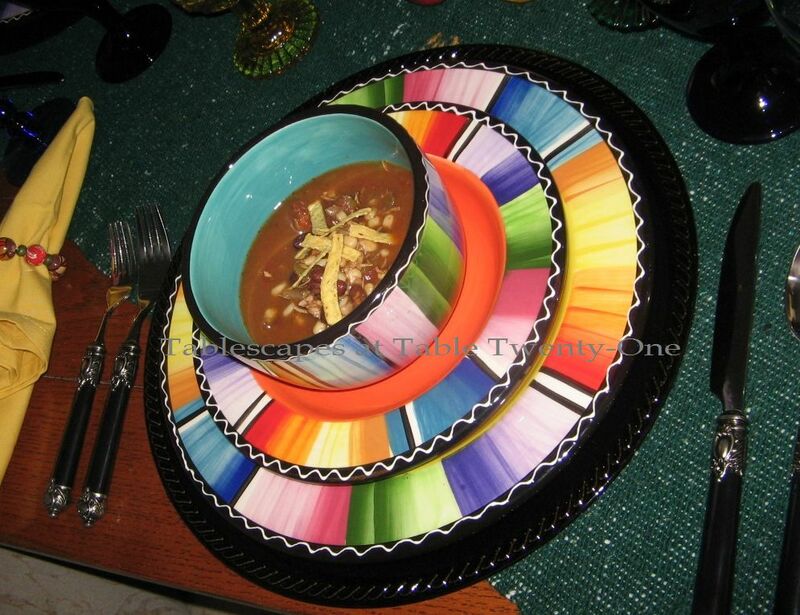 These are a fantastic way to present the dinner or luncheon main course! Lightly grease six 5″ ovenproof casserole dishes. Set aside. Pour chicken mixture evenly into prepared casserole dishes. Spread Bisquick mixture evenly over top of each. Bake at 400 degrees for 30 minutes. Remove from oven. Brush crust lightly with melted butter, if desired. Garnish with fresh parsley or rosemary sprig. Spray Bundt pan with PAM for Baking (or grease pan well and lightly dust with flour). Set aside. Cream together well the butter, shortening and sugar. Add the eggs to the creamed mixture. In a separate bowl, sift together flour & baking powder. Add to creamed mixture alternately with milk. Stir in extracts. Spoon into Bundt pan. (Mixture will be a bit thick.) Bake at 325 degrees for 90 minutes or until cake tests done with a toothpick. Cool in pan for 10 minutes on a rack. While the cake is cooling, prepare glaze. Using a toothpick, poke holes all over the cake while it is still in the pan. Pour 1/2 of the glaze over the pan. Let it sit for 30 seconds, then turn the pan out onto cake plate. Carefully poke more holes in the top of cake and pour remaining glaze over it. 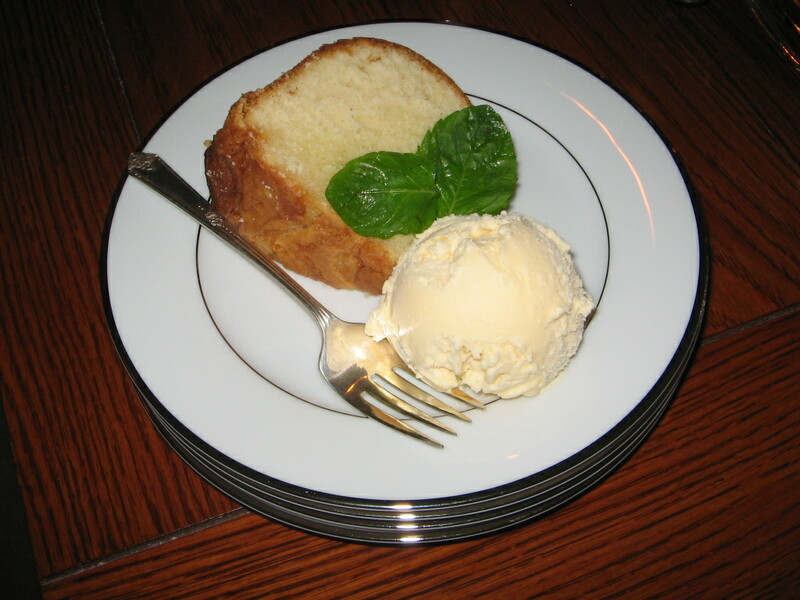 Best served warm with a bit of ice cream or freshly whipped cream, but it’s mighty tasty at room temperature, too! Enjoy!!! My sister-in-law served this incredible shrimp as an hors d’oeuvre at her graduation party. (Hooray and congrats!) It’s got some kick to it, so adjust the amount of red pepper according to what you and your guests can take! Preheat oven to 350 degrees. 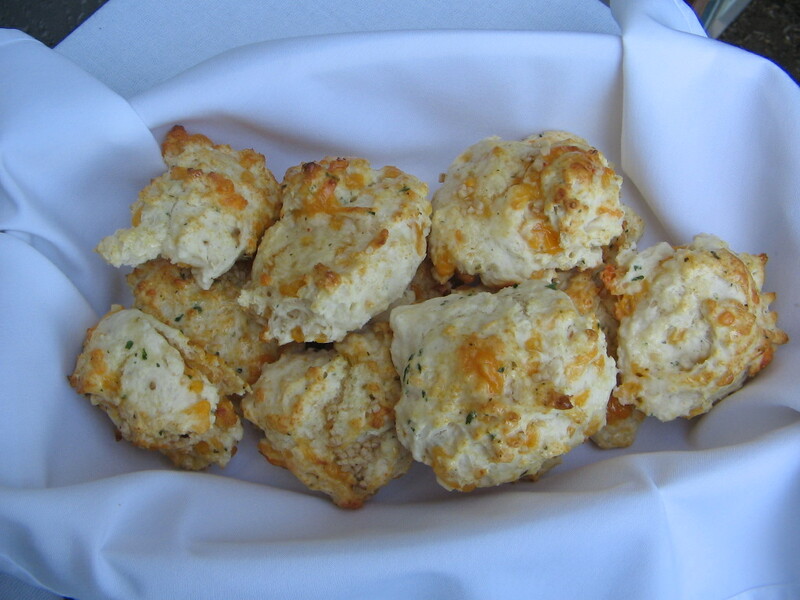 Melt butter with minced garlic in the oven. 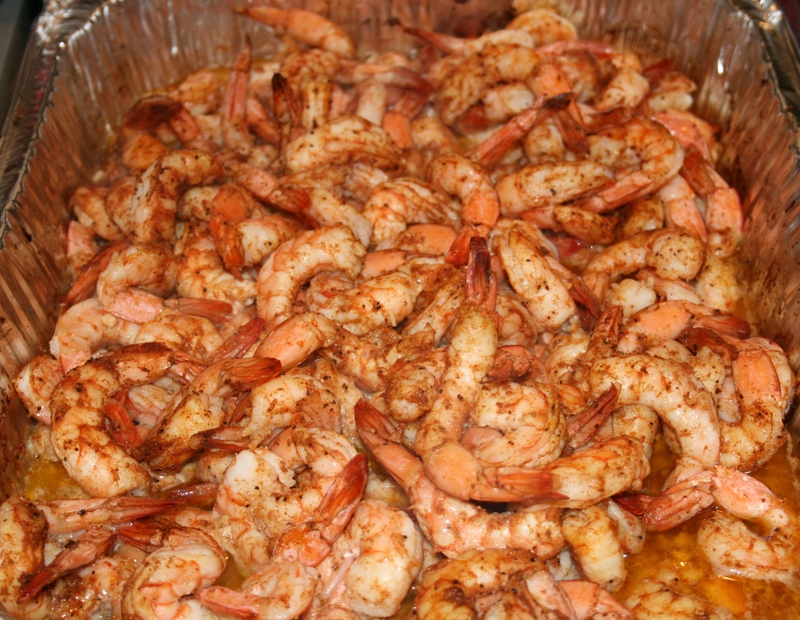 When the butter is melted, add shrimp and sprinkle generously with Cajun Seasoning. For some the Cajun Seasoning is all you need, but for those brave folks who want a little extra kick, sprinkle a pinch or two of the Chinese Red Pepper Seasoning over the mixture. (For more even distribution, combine Cajun seasoning and red pepper seasoning before sprinkling over shrimp.) Squeeze fresh lemon juice over your shrimp and add white wine. Bake until shrimp turn pink (about 8 minutes), stirring once. Remove from oven and serve immediately. Note: We really like the Louisiana brand Chinese Red Pepper Seasoning, but it is not available in all markets. It can, however, be ordered online at http://www.louisianafishfry.com/. You might also try other powdered red pepper products available in your area. Remember…just a pinch, taste, and then more if you can stand it! 🙂 Delicious!!! I am stealing the individual chicken pot pies. Can’t wait to try them!!!! I LOVE IT!!!!! Thanks so much for posting this wonderful recipe! I wanted to check out your site. It’s beautiful! I’m that blogging friend of Jackie Harrol’s. Thanks so much for your comments on my blog and sharing the recipes with your friends. Hi, Kimberly! Thank you so much for visiting! I absolutely do remember you, and I just picked up your recipe for the green beans. Have a great weekend, and thank you again for dropping in! I went out on a ledge and made the cobbler! It’s in the oven now…I’m nervous! I’m more of a cupcake/cake or bar girl, so this is definitely out of my comfort zone! Delicious ideas! I will have to give them a try, so mouth-watering! 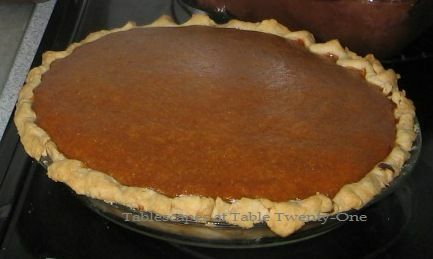 Just made the sweet potato pie! My childhood favorite and this is a great recipe. Thanks, Alycia! !